Down syndrome is a genetic condition which causes varying degrees of learning disability as well as other health problems. Nearly one baby in every 1000 born in the UK has the condition. Parents are often frightened and confused by the birth of a baby with Down syndrome, and they need reassurance as well as up-to-date information regarding the condition. edition also includes new recommendations regarding routine health checks in line with those of the UK Down Syndrome Medical Interest Group (UKDSMIG). 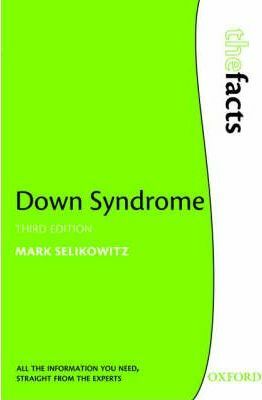 Additionally the book covers new prenatal screening methods which have been developed to identify Down syndrome during pregnancy. Dr Mark Selikowitz is a consultant developmental paediatrician based in Sydney, Australia. He has extensive experience of treating children with developmental problems and is the author of several other books, including "Dyslexia and Other Learning Difficulties: The Facts" (OUP, 1998) and "ADHD: The Facts" (OUP, 2004).